This site provides insight into the lived experience of post-traumatic growth. The site presents visual and written snapshots, and stories of growth that were collected as part of a multidisciplinary project led by researchers at the University of Melbourne, and funded by the Melbourne Social Equity Institute. This site is a resource for people dealing with the impact of direct or vicarious trauma. It is for people personally affected by trauma, as well as workers, volunteers, and organisations, including government, that provide support in the aftermath of trauma. The accounts presented here were shared by people who were personally affected by the 2009 Victorian ‘Black Saturday’ bushfires, people who volunteered or worked in the bushfire management space, and people who were both professionally and personally involved in the bushfires. Men and women of various ages and experiences, from rural, regional, and urban locations, generously participated in the project and shared their accounts of post-traumatic growth. The information was collected as part of a survivor-led research project, The Black Saturday Post-traumatic Growth Project. The research team includes an individual personally affected by the Black Saturday bushfires and five researchers from diverse disciplines – Social Work, Medicine, Visual Arts, and Computing. Encourage use of the words post-traumatic growth. 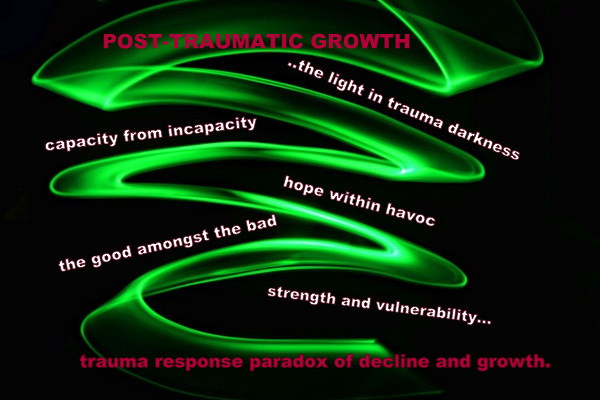 Spotlight the paradoxical experience of growth within trauma decline. Make PTG a mainstream topic in trauma recovery conversations, policies and practices. The post-traumatic growth stories on this site come from people who were exposed to trauma and losses that are too many and too great to detail individually. Sincere condolences and compassion are offered to all involved. The most devastating of all losses, the tragic loss of life, is respectfully acknowledged, as is the trauma-related hardship and decline that underpins the growth.